Since imprisonment became directly associated with criminality in the antebellum period, military prison inmates internalized this same criminal stigma. One unknown prisoner expressed this sentiment succinctly when he penned, “I’m doomed a felon’s place to fill,” on the walls of Washington’s Old Capitol Prison. The penitentiary program also influenced the mindset of military prison officials who hoped that the experience of imprisonment would reform enemies into loyal citizens, just as the penitentiary program was supposed to reform criminals into productive citizens. Angela Zombek examines the military prisons at Camp Chase, Johnson’s Island, the Old Capitol Prison, Castle Thunder, Salisbury, and Andersonville whose prisoners and administrators were profoundly impacted by their respective penitentiaries in Ohio; Washington, D.C.; Virginia; North Carolina; and Georgia. 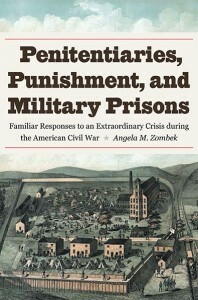 While primarily focusing on the war years, Zombek looks back to the early 1800s to explain the establishment and function of penitentiaries, discussing how military and civil punishments continuously influenced each other throughout the Civil War era. Author Angela M. Zombek is assistant professor of history at St. Petersburg College in Clearwater, Florida. She has written numerous articles and book chapters on imprisonment in the Civil War era, including “Paternalism and Imprisonment at Castle Thunder: Reinforcing Gender Norms in the Confederate Capital,” in Civil War History (September 2017). She is currently working on a book on Key West under martial law during the Civil War.